Our first night in Boston we were really craving pizza. I had gotten a recommendation from the Boston Chowhounds and decided to give Antico Forno a try. Roughly translated Antico Forno means old oven; which is exactly what takes up the back wall of this tiny restaurant. 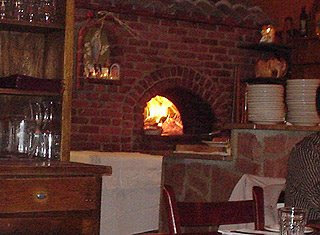 The brick oven at Antico Forno is not only for pizza. The restaurant cooks or finishes several of it's pasta and meat dishes in it. We started our dinner with the involtini di melanzane. Thin slices of eggplant were stuffed with ricotta and basil and baked in the oven Parmesan style. It was absolutely delicious. We decided to share a pizza for our entree. I let my husband pick and he ordered the capricciosa. 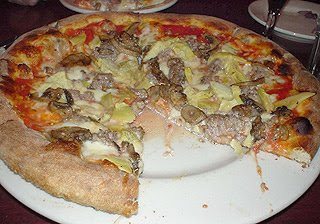 The pie was topped with sausage, mushrooms and artichoke hearts. The taste was good but the pizza was a little too wet and the crust not as thin as I'd have liked. Boston's North End is filled with Italian restaurants and pastry shops. So we decided to go elsewhere for dessert. The whole area was really crowded for a Thursday night. We did eventually find a place and enjoyed some espresso and Italian pastries. Day 2 and I was left to wander the streets of Boston alone while my husband worked. (yes, he did actually work on this trip) I stumbled across what's known as the Haymarket. 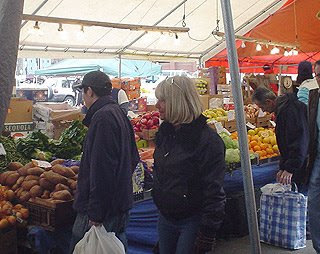 It's a huge outdoor market selling fresh fruits and vegetables, fresh meats, cheese and even fish. It reminded me a lot of the Italian Market in Philadelphia. Crowds of people and everyone shouting.The prices were so good it made me wish I wasn't a tourist. There was so much I wanted to buy. But I wasn't about to cart bell peppers or ears of corn onto the plane. So I just kept walking towards the North End, where I was hoping to grab some lunch. Just as I was rounding the corner onto Salem Street it started to pour. So I stepped into the closest store, Monica's Mercato, to wait out the rain. Monica's is a cute little store jammed packed with Italian specialties. One of which was burrata. The man behind the counter explained to me how they had just gotten the burrata in that morning and how delicious it was. I wanted to try some burrata in the worse way, but once again being a tourist was not helping the situation. I explained my dilemma to the shop owner and he was very sympathetic. He told me that everyone needs to try burrata and handed me flatware, napkins and even a small plate. I was so excited I left immediately. I made one stop at a bakery to grab a loaf of crusty Italian bread and then headed straight to the hotel. I had totally forgot about the rain. I called my husband, who had just finished working, and told him to meet me in the hotel room ASAP. When he got there we enjoyed a gourmet lunch of burrata and Italian bread on top of our hotel bed. Not the ideal situation but it was still delicious. For those of you who don't know; burrata is an Italian cheese made from mozzarella and cream. The outer shell is mozzarella and the inside is a mixture of cream and mozzarella. Burrata has a very short shelf life and can be pretty hard to find. If you've never had it I would highly recommend tracking some down. Later that night we were walking along the rainy streets of Boston's Beacon Hill area; reminiscing about our rainy trip to Ireland, when we found the Bean Town Pub. With Ireland on the mind pub food just seemed appropriate. There was a crowd at the Bean Town Pub but we were able to get a small table for two in the bar area. The menu was large and included all of your typical pub fare. We enjoyed salads, burgers and some drinks while watching the Red Socks on one of the many TVs around the bar. The next day turned out to be sunny and uncharacteristically warm. It was so hot by the time we finished our tour of the Boston Public Library that we were able to shed our coats. We did some shopping along Newbury street and stopped for lunch at Bouchee. 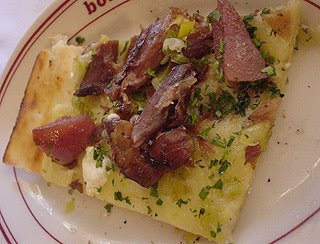 Not wanting to eat a large meal we decided to split a duck, melting leeks and goat cheese pizza. The waiter talked us into adding some caramelized pears and I'm glad we did. The combination of sweet pears contrasted nicely with the leeks and goat cheese. Bellies full we walked through the Boston Common back to our hotel. Dinner that night, our last in Boston, was the highlight of the whole trip. So I've decided to write a separate blog about that meal. Stay tuned for Part 3. Boston's such a great food city. The North End is legendary for it's Italian restaurants. Somehow in all my time in MA, I never ate at any of them. :) We mostly stuck with sushi and Chinese near my friend's place at BU. It certainly makes me homesick for New England. I've often heard about the delicious food and wonderful restaurants in Boston and this place certainly looks wonderful! Thanks for sharing your experiences!